It may not be spring just yet–the last official day of winter is March 20—but it’s not too early to plan the steps you need to prepare your lawn and garden for the growing season. What plans do you have for your garden this year? Make a garden plan. Consider attending local garden classes. Many free or inexpensive short courses are offered at garden centers and botanical gardens. How has your garden hardscape fared through the winter? Trellises, fences, raised beds, or garden structures can be repaired on nice days throughout late winter. 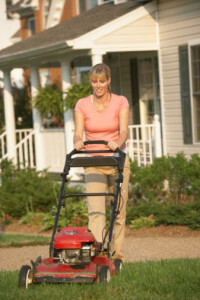 Do you plan to hire a lawn service to aerate your lawn? Will your irrigation system need some repair before it can function properly? Schedule those services now while you have the best selection of appointment times. Soil compaction: that happens when you walk on wet soil. Then grass just won’t grow as well. Root damage: this occurs when walking on soil that has thawed on top but remains frozen underneath. The tops of the tender plants are cut off from their roots. And overactive raking and mowing can also damage tender roots and allow early germinating weeds to infiltrate the grass. Are any of your tools missing or damaged? Now is a good time to clean, sharpen, and oil garden implements. And this is the ideal time to pay some attention to your lawn mower: sharpen the blades and change the oil, spark plugs, and filters. Once your lawn is thawed and dry, its time to remove the dead tops of your grass. This provides the emerging grass with the sunlight it needs to thrive. Be careful not to set your mower deck so low that you cut the crowns of the grass. Aerating supplies the soil with air, reduces soil compaction, helps to control thatch, and lets water and fertilizer move into the root zone. Fall is the best time to aerate, but spring comes in a close second. The most effective type of aeration is when plugs of soil are pulled from the lawn. Thoroughly water the lawn the day before, so that longer plugs can be pulled more easily. Keep from damaging your sprinkler heads, shallow irrigation lines, landscape lighting and cable TV lines by marking them before the process. Although they aren’t attractive, leave the cores on the lawn to allow them to work back into the grass. Lawns may be fertilized and seeded immediately after aeration. Hydro Mousse makes reseeding bare or damaged patches of lawn easy. At this time of year, begin by watching the temperatures: grass seed will start to germinate when soil temperatures reach 50° F, and be sure to wait until after the danger of frost has passed. When the temperature is right, follow the product’s easy directions. Make sure to prepare the areas properly and water them daily. Get your seeding done early enough so the new grass plants have time to develop strong roots before the summer stress period.